WILMINGTON – In light of the passing of HB2, the so-called “bathroom bill,” earlier this year, several musicians and artists canceled shows in the Tar Heel State. Not Michael Franti, a singer-songwriter and self-proclaimed “soul rocker” who has called attention to social injustices throughout his decades in the music industry. During his visit to Wilmington on July 18, Franti teamed up with yogini Seane Corn to host a yoga and music fundraising event at Battleship Park, sponsored by HUKA Entertainment and 98.3 The Penguin. The event focused on “not just tolerance, but acceptance” of all people. The event was attended by 250 people and raised over $10,000 for Equality North Carolina and the Human Rights Campaign, organizations that work to secure equal rights for the LGBTQ community in the state and in the country. The Rex Foundation, a non-profit founded by members of the Grateful Dead and their families that lists “help secure a healthy environment” and “promote individuality in the arts” as some of their goals, among others, has also gotten involved. According to a news release, they’ve agreed to match the amount raised at the fundraiser and make their own donations to the organizations. The fundraiser was not the first time Franti and Corne brought yoga to the Battleship North Carolina. In 2014, his band, Michael Franti and Spearhead, brought their Soulshine Festival to the park. 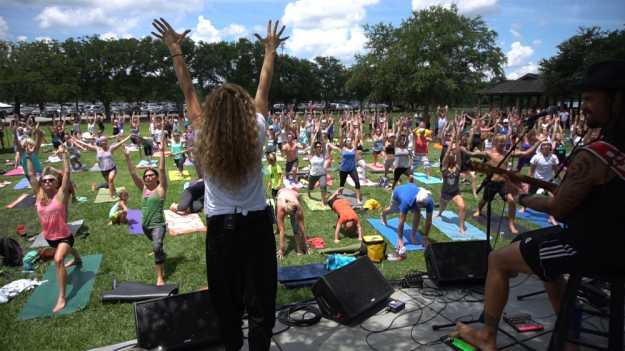 The event, part of a national tour, combined yoga and live performances by several musical acts.